This post will have entries 11-20. The moon is made of my late husband’s ties. The tie-dyed orange fabric is/was a sun dress. Chenille created with scraps of fabric. The entire challenge had me challenge myself to learn a variety of skills, including ruler work, chenille with scraps, and applying binding by machine. It’s not perfect, but it’s a start. Machine pieced, machine quilted, and machine appliquéd by participant. This entry won Third Place. A bag of silk ties languished in my sewing room for years waiting for a proper showcase. The designs are so artful. The aqua/green tie is reversed to show how the designs are printed through the silk. Note the “CU” is backwards. The sashing and border are from a Ralph Lauren wool suit pants. Some of these vintage ties are still on eBay! The dinner napkins were my mother-in-law’s. She prided herself with her beautifully set tables: dishes, linens, silver, and flowers. Machine pieced and quilted by participant. This quilt won an Honorable Mention. This quilt was made entirely from once scrap bag of fabrics left over from making four heirloom wedding quilts for my niece & my three nephews’ brides. I have the distinct honor of being the only aunt in the family to have made each bride cry at her wedding shower after opening this gift of a wedding quilt that contained wedding dress pieces & other fabrics belonging to all the women in the family. Happy Tears! In the scrap bag were leftover squares & strips of quilting cottons in white/beiges & colors chosen to match each bride’s wedding colors as well as various odd size pieces of satin, tulles, lining fabrics & appliqués left over from family wedding dresses belonging to the bride & groom’s aunts, mothers & grandmothers. There were also pieces of linens & laces from two great grandmothers. Some of these scraps were so tiny they had to be sewn together to make some of the 2 ½” squares in the background. The backing is a “never will be used by me” pink linen tablecloth & the batting is scrap pieces saved from other quilts. 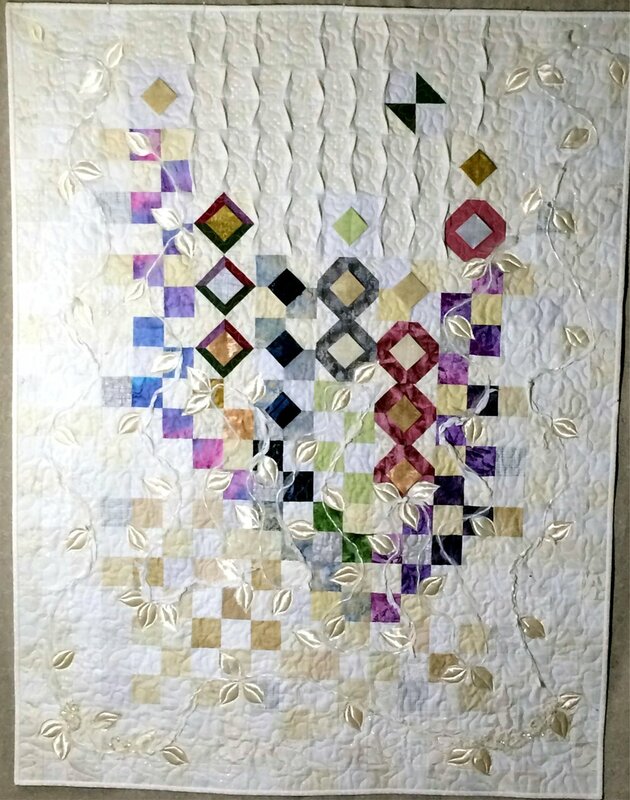 As I look at this quilt, I see the few leftover purple blocks & beige squares from Mary’s quilt & the blue bow tie blocks & the satin leaves & tulle wrapped around rattail vines from Janessa’s quilt. The leftover plum & gray 3D diamond blocks & the white folded flanges are from Lyndsay’s quilt; the pink, purple & blue watercolor squares & the sparkling appliqués are from Jen’s quilt. I see the leftover little scrap pieces from all the women in our family, including one tiny piece from my own wedding dress. This is a remembrance quilt for me! Machine pieced, quilted, & appliquéd by participant. This entry won First Place. When living in Japan, I collected many vintage kimonos and haoris. Some of these have beautiful silk linings. While taking these garments apart, I kept the fabrics as well as the linings. I made bags, quilts and other projects from the kimono and haori fabrics, but this is my first time using some of the linings. I had been wanting to use the silk linings in a project for a long time, so when this challenge was announced, there was no hesitation as to what I wanted to do for “Make it Work.” The fabrics on the top come from 9 different garments and are all silk linings. The design developed as I was fussy cutting and playing with the prints and the shapes. This year is one of major changes in my life: graduations; being an empty nester; and a divorce. My personal mantra is, “Keep moving forward.” I was inspired to do an arrow motif to show forward movement. Upon looking for materials in my home, I was faced with a personal history of fibers that told the story of my life thus far. The arrows are made from my own clothes from the past; shirts, jeans and school uniforms from my boys; upholstery pieces from previous homes; and shirts and silk pocket squares from my ex. Old designer labels are sown in the past, as they are no longer important. The clothes, the fabric – it’s just stuff. “The only baggage I can take is all that I can’t leave behind.” (Walk On, U2) There is space in front of the arrows – an unknown – so that I keep moving forward. Machine quilted, machine appliquéd, and hand embroidered by participant. On a European trip in 1972, my husband and I purchased a fine luncheon tablecloth and napkins in Belgium. We were intrigued by the beautiful lace work that had been traditionally created by talented needle workers. It has remained, unused, in my linen closet for 46 years. The linen set was so fragile and lacy that I was intimidated by washing it and was afraid it would never look the same. The brilliantly colored embroidered appliqué design that forms the border of my wall hanging was carefully cut from a beautiful jacket that my sister Sarah loved to wear. It has hung in my closet for eight and a half years. Sarah passed away in 2011 and I decided to honor her memory by creating a memorial art quilt for her. Machine pieced, quilted, and appliquéd by participant. This quilt was made to honor the three women who have helped to shape who I am. The first is my grandmother, who was my best friend. It was she who fostered reading, fine cooking, and my love of Biology. Her handkerchief is incorporated into the Bulletin Board of the quilt along with her picture. My sister Nancy was also a phenomenal role model for me. She was fearless and tenacious. She had health issues right from birth, but no one would know it by her lifestyle of fierce tenacity. She handled whatever life gave her the same way. Her heroism in the face of impending organ transplant and cancer was outstanding. The wedding gown in the quilt, as well as the ring bearer’s pillow and flower girl basket, was made from the robe she used in the hospital. She is also maid of honor in the last wedding picture. Machine quilted and machine appliquéd by participant. Original Design created in EQ5 (Electric Quilt) using silk blouses and dresses from the 70’s and 80’s in an elongated Log Cabin block design. Silk clothing worn during my business career working internationally and nationally, as well as my mother’s and a close friend’s black silk disco dress! Machine pieced by participant; quilted by a longarmer. 1076 pieces in the quilt.